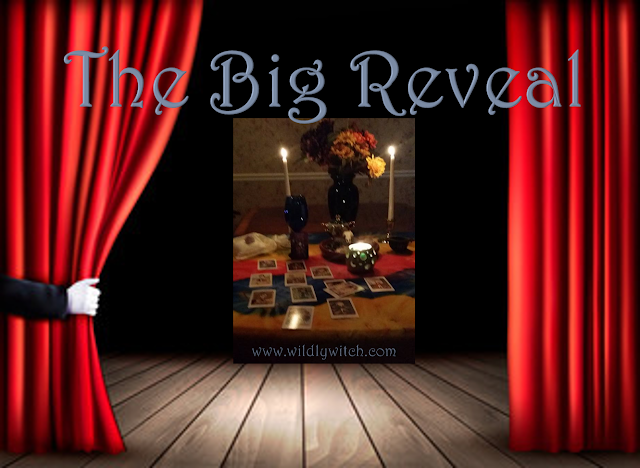 It's time for Tarot Tuesday's Big Reveal. If you haven't done so, please go to the Wildly, Witch Facebook Page and follow the directions. If you've already performed the exercise, let's take a look at today's card. The deck is The 78 Tarot Carnival. "The 78 Tarot Carnival is the third collaborative deck produced by global art project, The 78 Tarot Project. This deck is a wonderful, wild trip to the circus with and has cards created by 78 different artists all over the global! It includes cards created by Jasmine Beckett-Griffith, Selena Fenech, Merridith Dillman, Larry Elmore and Paulina Cassidy. 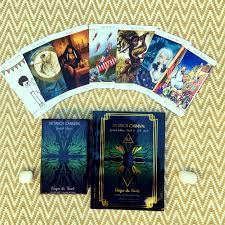 Created by Assorted Tarot Deck - 81 Cards - Self Published, larger sized cards approx. 6 x 3 1/2" Really stunning!" When the Nine of Pentacles appears in a Tarot reading, do not be scared to splurge, indulge or pamper yourself, especially as a reward for all of your hard work. Treat yourself to a special occasion or a personal gift to celebrate your journey here. You have already achieved so much, and while you may not be at the finish line just yet, this is your opportunity to acknowledge your achievements, and re-energize yourself for the final phase. The Nine of Pentacles also speaks of financial independence. 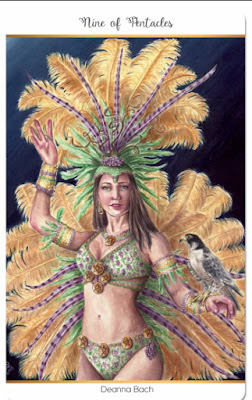 The woman in this card has created a luxurious lifestyle by her own actions and efforts. She encourages you to do the same – to create abundance and independence so that you can take care of yourself in the long-term. Invest wisely and seek financial advice to make the most of your wealth. Don’t rely on others to support you; this Nine is an independent woman. While the suit of Pentacles typically focuses on material wealth and gain, this card also suggests that you are in harmony with the environment around you. You appreciate the beauty and abundance found in nature, and you can harness this high-vibe energy to bring pleasure into your life. You may enjoy gardening or floristry, or you may just like to pass your time in the beauty of nature with picnics or walks in the park. Key words: Independence, success, financial stability/security, profit, prosperity, wealth, property, abundance, rewards through hard work, collecting on investments, thriving business, status, freedom, wisdom, maturity, indulgence, contentment, self-discipline/ control/ reliance, sophistication, elegance, grace, beauty, pregnancy, birth, menopause, mature or independent woman, retirement, taking it easy. How did you do? Come on back to the Facebook page, and leave a comment. Let me know how I can best support you!